ROLL THROUGH THE URBAN JUNGLE WITH SPEED AND STYLE. CROSS CITY DISC EQUIPPED HELPS YOU PUT SOME ADVENTURE INTO YOUR DAILY ROUTINE. 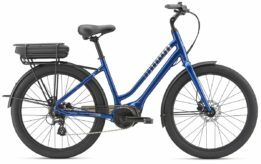 Built with a lightweight ALUXX aluminium frame that’s designed for smooth-rolling 700c wheels, the 2019 Giant Cross City 2 Disc Equipped is a fun, efficient bike that’s versatile enough for city commutes or longer rides to build up your fitness. Stable geometry and a wide range of gears make it easier to tackle hilly terrain, even when your racks and cargo bags are loaded. 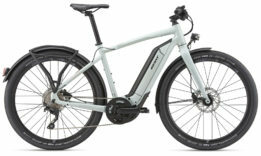 And it’s designed with neutral, upright positioning, which helps you navigate city streets or crowded bike paths. Outfitted with fenders and a rear rack, you can easily carry your work essentials or head out for a weekend adventure. Choose the disc-brake model for powerful braking in all types of weather, or a standard brake model. It’s true that Giant is the world’s largest producer of high-quality bikes, but they never forget where we came from. Giant started small, and were founded on the idea that the best way to inspire passion for cycling is to create the best products, and make them accessible to all riders.